This trip should have been an easy one. 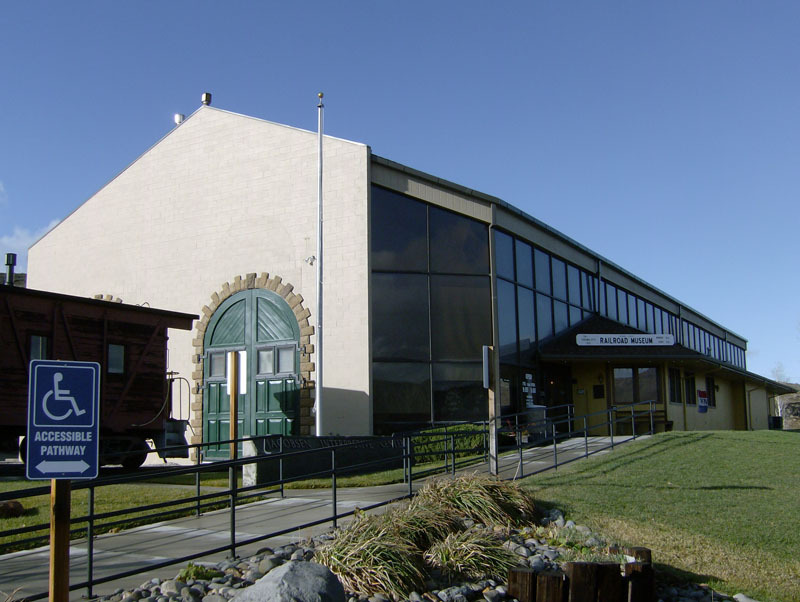 To go to the Nevada State Railroad Museum in Carson City from Reno is simple; you take Highway 395 South until you drive into Carson City. Looking out the window of my apartment’s lobby, however, all I could see was a wall of rain, a rising river and people frantically filling sandbags. 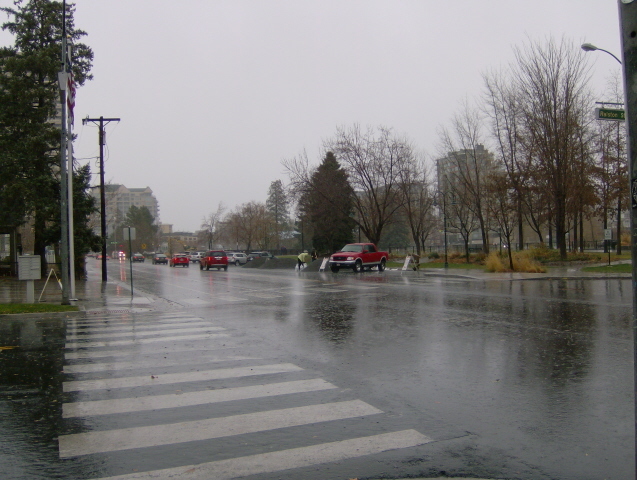 December 2012, Reno, Nevada. Perfect father/son bonding weather. I tell my 13-year-old son Lucas to get dressed because a little rain and flooding isn’t enough to stop us from going on our adventure. The highway, peppered with cars and trucks as we traveled south, was soaked. My windshield wipers worked to keep visibility within the realm of, well, being able to see if I was on the road and not much better. Then the driver’s- side wiper suddenly snapped, hanging lifelessly next to my side-view mirror. I had to navigate with nearly zero visibility. My windshield would clear up enough for me to see the road, only to get splashed by trucks as they passed me. As we drove down South Carson Street, we looked for the museum. To our right we saw the black smoke of an old locomotive that served as a clear sign that we just passed the museum. We turned around and parked. Trains are a part of Western American culture. The expansion across the Mississippi River, over the Rocky Mountain Range to the West Coast could not have happened as quickly without the railways. Lucas and I sitting on the train. Lucas asked if we could go on the steam train ride first. We got tickets and boarded the passenger car. Inside, the car had strained wood edging and wooden window shutters. The rod-iron seats covered in burgundy velvet upholstery sat in neat rows. The smell of wood and burned kerosene filled the car. After a few minutes, the train’s whistle blew, the chugging of the engine began and we started to move. The train ride was short, maybe ten minutes. The train traveled in a quarter-mile circle twice and stopped back at the station. During our trip, Santa Claus, or rather a very poor impostor, came out and gave candy canes to kids and adults, wishing everyone a Merry Christmas. Parents took pictures of Santa with their kids, who were delighted that Santa joined them on the train. A man sat in Santa’s lap with his kids around him as his wife took a picture him. Lucas complained. 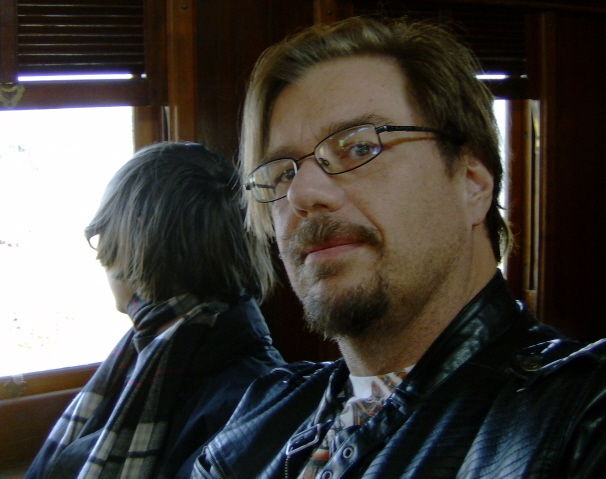 He felt Santa ruined the feel of sitting in a hundred-year-old train car. It took him out of the moment. He and I wanted the experience of travelling like people did when the train was the source of mass transportation. After we disembark, we crossed the parking lot to the museum. We entered, paid for admission and walked through the museum. The interior of the museum was bland, almost industrial, with its concrete floor and dark lighting. There was nothing in the entryway encouraging people to take a trip through the museum. The displays featured many cars and engines, all restored, with bits of Nevada history printed next to the trains. 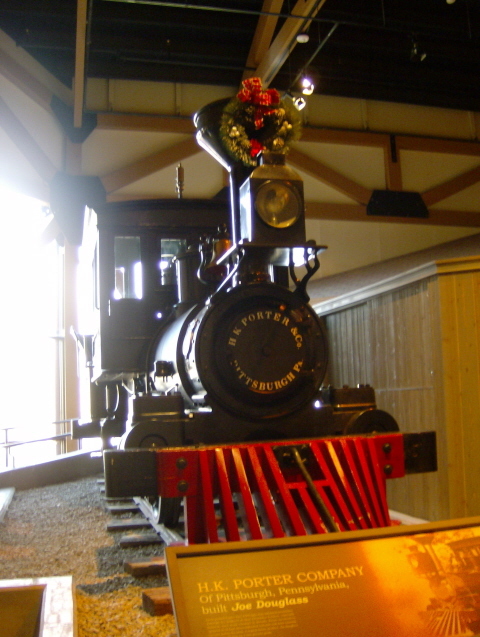 Many of the trains had small Christmas trees or wreaths displayed on the front of the engines. Much like Santa’s high jacking of our steam train ride, this was a distraction. Before leaving the building, we stopped at the gift shop. It had many of the usual trinkets and souvenirs I expected to see. But it also sold many books about Nevada’s train history along with DVDs about trains, both documentaries and motion pictures. Outside of the museum building, we visited the garage, where the trains are restored. 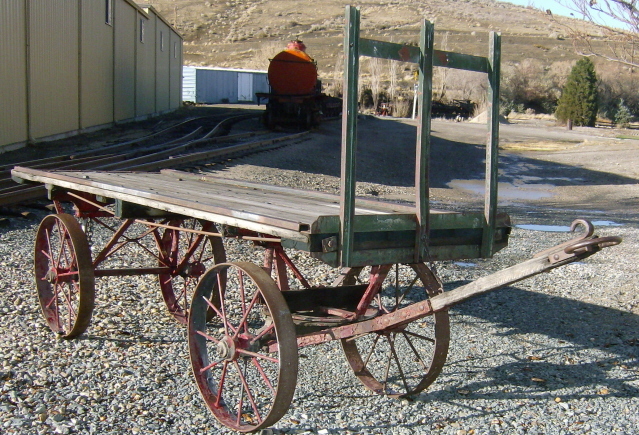 Walking toward the garage, I saw an old cart with rusted wheels and a dried, cracked wooden flatbed. Trains, in various states of repair sat alongside other ones, aged beyond repair, the smell of oil and burnt wood filled the air. On one side was a shop with tools and equipment. Rich, a tour guide, told us stories about some of the cars. One particular car the V & T McKeen car No. 22 stood out among the others. No. 22 was a self-powered passenger car that took travelers from Minden to Carson City to Reno. It is an elegant-looking machine, even by modern standards. Rich invited us inside the car, asking us to please be careful because the interior was fragile. It featured restored wood paneling. The aft featured a horseshoe-shaped bench with large round windows that resemble portholes on a ship. It looked like it came out of a Jules Verne novel, a vision of the future from an early twentieth century point of view. I imagined what it would have been like riding such a car from Reno to Carson City. I tried to recreate in my mind the lifestyle of people at that time. They worked harder, but seemed not to be in a rush to get from point A to point B. The drive from Reno to Carson by car is pleasant, when diluvial destruction isn’t a threat. But standing in the McKeen, as much a work of art as a vehicle, made me think that society as a whole has lost some of the experience of travelling in our destination-oriented culture. Rich showed us old passenger cars, with broken windows and chipped paint. As he talked about the history of the cars, all I could think about were old episodes of The Lone Ranger and other westerns that I watched as a kid at my grandmother’s house. I mentioned to Rich that the cars reminded me of those movies, with bank robbers riding on horseback to rob the train. He said these are exactly the cars that would have been robbed that way in the Old West. 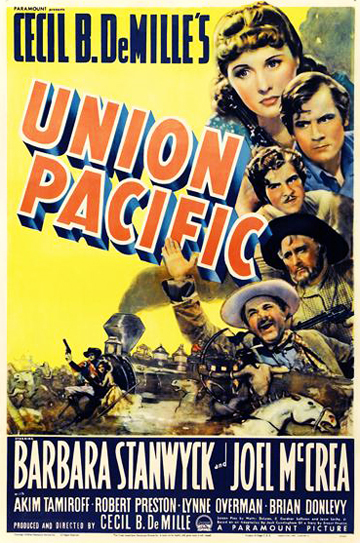 Cecil B. DeMille’s epic “Union Pacific” featured the No. 11, renamed the Union Pacific No. 41. The film starred three other V&T locomotives. Photo courtesy Paramount Pictures. 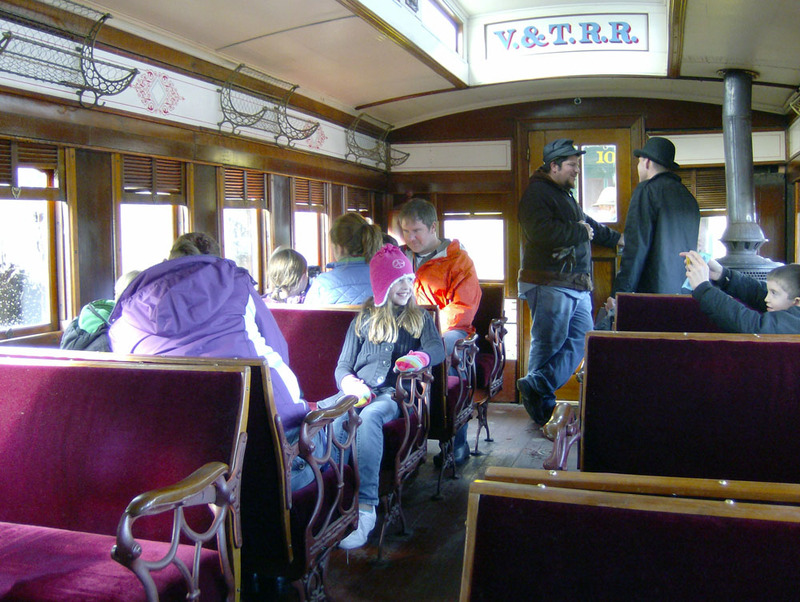 Then we hopped onto the hand car, a flat car with a manual lever that two operators move up and down to keep it moving. Lucas and I took it to the end of the track by the garage and back. Even at 13, Lucas had fun working the machine. As the sun began to set, we decided it was time to leave the museum, get something to eat and I needed to stop at a store and get an adjustable wrench to fix the car’s wiper. I wanted to stop at a local place. One caught my eye down the road. Lucas, however, wanted to go to King Buffet, an all-you-can-eat Chinese restaurant. A growing teenage boy’s appetite and all-you-can-eat dining go together well. Since it was Sunday, the restaurant served crab and shrimp, two of Lucas’ favorites. As he sat in front of a plate full of pink and white crab legs, determined to single-handedly eat the creatures into extinction, I asked him what he thought of the train museum. He thought the train ride was fun, but Santa ruined the experience. The museum itself, he said, bored him. It just didn’t have anything to grab his attention. However, he liked going to the garage, where he could see the work being done on the trains and he loved the manual cart. I agreed with him. The inside of the museum had some interesting displays, but it presented them in a dull way. The garage, however, felt more genuine. Trains, like much of America’s development, succeeded because of a lot of hard work. The garage had that feel. Perhaps some of the tools used to restore the trains are modern power tools; however the work of fixing the trains involves old-fashioned hands-on work. The Nevada Train Museum was an imperfect experience, but it is still a good way to dig into Nevada’s history. Open Thursday – Monday, 9:00 a.m. to 5:00 p.m. Admission is $6 for adults. Museum members and children under 18 are free. I originally wrote this December 2012, so specifics might have changed at the museum.